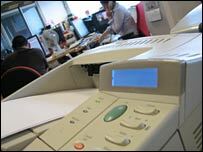 The humble office laser printer can damage lungs in much the same way as smoke particles from cigarettes, a team of Australian scientists has found. An investigation of a range of printer models showed that almost a third emit potentially dangerous levels of toner into the air. The Queensland University of Technology scientists have called on ministers to regulate these kinds of emissions. They say some printers should come with a health warning. The researchers carried out tests on more than 60 machines. Almost one-third were found to emit ultra-tiny particles of toner-like material, so small that they can infiltrate the lungs and cause a range of health problems from respiratory irritation to more chronic illnesses. Conducted in an open-plan office, the test revealed that particle levels increased five-fold during working hours, a rise blamed on printer use. The problem was worse when new cartridges were used and when graphics and images required higher quantities of toner. The researchers have called on governments to regulate air quality in offices. They also want companies to ensure that printers are based in well-ventilated areas so that particles disperse.